Every week new products arrive at THE NIBBLE. Most are good if not noteworthy. Some are so good that they become part of our personal shopping list. 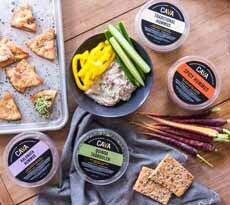 Cava Grill, a casual Mediterranean restaurant chain with locations on the East Coast an California, is now selling a dozen of its popular dips and spreads. You can find them at Whole Foods Markets and other specialty markets (here’s a store locator). Dips/Spreads: Crazy Feta, Eggplant & Roast Pepper, Harissa, Tzatziki. Hummus Flavors: Greek Yogurt, Kalamata, Roasted Garlic, Roasted Red Pepper, Spicy, Traditional. Organic Flavors: Organic Caramelized Onion Hummus, Organic Traditional. One of our favorite light dinners is to serve as many varieties as we want with fresh pita, accompanied by a lettuce salad with bell peppers, cherry tomatoes, red onion, vinaigrette and chopped fresh herbs; capers and olives optional. Or, uncork some wine and invite friends and neighbors for a wine break. See the whole line at Cava.com. Ice cream is one of our favorite foods, and every day we bless Lactaid for an excellent (and well-priced) line. Every flavor is a winner. We recently had our first quart of Lactaid Mint Chocolate Chip Ice Cream, and it’s the best supermarket mint chocolate chip ice cream we can recommend: truly refreshing, with lively mint flavor and toothsome chunks of chocolate. The only difference is that a minute amount of lactase, the natural enzyme that helps people digest milk products—is added. You can taste it; no one would know the difference. Check out the other Lactaid ice cream flavors. Salted Caramel Chip is another must-try. The Damak brand of chocolate was established in Turkey in 1933. Turkey is the world’s third largest producer of pistachio nuts (after Iran and the U.S.), and the bars, in milk or dark chocolate, are packed with the nutritious little nuggets. Nestlé, which now owns the brand, has committed a million dollars to teach Turkish pistachio farmers more effective agricultural techniques to improve and increase harvests. Noosa has been one of our favorite yogurt lines since it first popped up in the U.S. via Australia, where yogurt is spelled with an “h” (see our review). Each new flavor the brand introduces is better than the last (although the Mexican Chocolate Yoghurt has yet to be topped on our personal list). Cava Grill Mediterranean Dips (photo Cava). 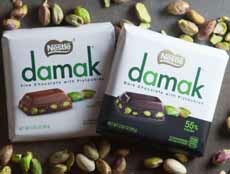 Nestle Damak pistachio chocolate bars (photo Nestle). 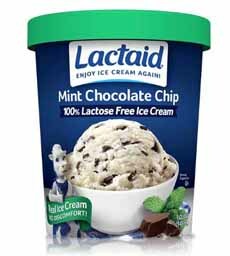 Lactaid Mint Chocolate Chip Ice Cream (photo Lactaid). Nonni’s Limoncello Pistachio Biscotti (photo Nonni’s Foods). 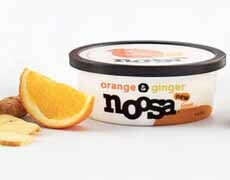 Orange-Ginger, one of three new Noosa Yoghurt flavors (photo Noosa). But every flavor hits the spot, and all are delicious enough to be served as a creamy dessert as well as breakfast, lunch and snack fare. See them all at NoosaYoghurt.com. 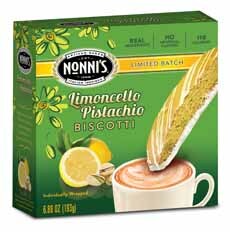 Nonni’s, the nation’s leading biscotti baker, salutes spring with two new limited-batch flavors. Nonni’s White Chocolate Cherry Biscotti are filled with cherries and white chocolate and drizzled with white chocolate icing. Nonni’s Limoncello Pistachio Biscotti are made with chopped pistachios and lemon peel zest, then dipped and drizzled inwhite chocolate. The biscotti are a softer style that are easy on the teeth, and are individually wrapped for grab-and-go. Check out the entire line at Nonnis.com.